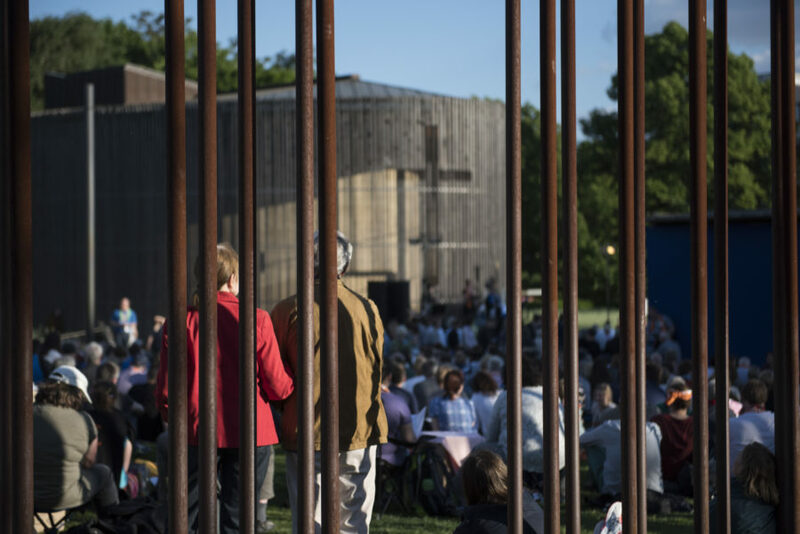 Participants of the Church Congress follow a communion service at the former location of the Berlin Wall's "death strip" in front of the Chapel Of Reconciliation. Image by Steffi Loos/Getty Images, © All Rights Reserved. Exhausted, we all sat down for dinner at the end of a whirlwind day that had spanned two continents. Our jet-lagged group included Republican lawmakers, the chief policy voice for a major evangelical organization, and a couple of folks like me with ties to the right-leaning non-profit that had helped to coordinate the trip. We had crossed the Atlantic to see Germany’s ambitious transition to renewable energy first hand. Now, we would dine at a stylish Berlin fusion restaurant called — I kid you not — Oxymoron. Our German guides did not intend it as a joke, but it was pretty funny. At Oxymoron, the chefs combined surprising ingredients in ways that sounded odd but meshed well if you were brave enough to take a bite. There were dishes like Irish lamb topped by lime olive salsa with spiced hummus on the side, and desserts such as baked chocolate polenta with green olive ice cream. One Southern legislator, no doubt more accustomed to having his fish deep fried, later pronounced his brazed sea bass sitting on top of who-knows-what to be the best meal of the week. There are lots of things that can seem strange at first, but, as our mothers told us: “If you try it you just might like it.” What seems politically oxymoronic in our shadowy time can be quite compatible when seen in the light of faith and history. There is truth in what Kirk says, but in a society that is increasingly polarized along political lines, many of the conservatives and “middle-class straights” that could be coming to the table are turning around once they get close enough to see that the liberals and those they perceive as “freaks” have already taken a seat. Even if you want to join in, many on the left will not let you sit down to dine if you have any discernible ties to the GOP. That contradictory mix of reverence for creation and an attitude of utilization that could bleed into rapaciousness is also a part of the story, especially in Republican circles. Roosevelt preserved the Grand Canyon and established wildlife refuges but pushed for dams elsewhere and often shot animals that he could never even recover. Nixon’s environmentalism was probably more political calculation than personal crusade. Schaeffer’s call for creation stewardship was largely ignored by the Jerry Falwell types that he otherwise inspired to enter the political fray. John McCain championed bipartisan climate change legislation in 2003 but later chanted “drill baby drill” with sidekick Sarah Palin in 2008. In short, environmental history is a bumpy ride on the right. The left has its contradictions too. Labor and greens have not always been on the same page, for example. But since the 1960s the leaders of the environmental movement have largely viewed themselves as part of a larger progressive movement, even as they sought to stop what others saw as the march of progress. Those liberal leaders generally looked askance at Republicans — giving only faint praise to Nixon, rolling their eyes at Reagan, and providing little political cover for those like McCain who occasionally stepped up to champion a green cause. Such politicians began to feel that whatever they did would never be enough for the environmentalists, and so most stopped trying at all. We remaining right-wing treehuggers usually joined the modern conservative movement out of another primary concern — to fight Communism, to fight the debt, or, as in my case, to protect unborn life. We have simply refused to shed our green backpacks. Having grown up in a rural Bible Belt setting with a small lake in my childhood front yard, God and the great outdoors have always gone together for me, as have being pro-life and pro-planet. Conservative conservationists are walled off to our left — unable, on principle, to align with liberal environmentalists who see abortion and socialism as part of a green solution. Yet, our green concerns, even though rooted in conservative principles, now make us targets on the right. Driven by tribalism, too many fellow conservatives simply view anything that smacks of environmentalism as belonging to the dastardly domain of the other side. As I have heard on more than one occasion, “If Al Gore’s for it, I’m against it.” Those of us who believe conservative thought should have more to offer than that risk being walled off on our right. We stand our ground, though, because we do not believe the wall should be there in the first place. Before dining at Oxymoron, our group of greenish conservatives had visited a somber site. Built in 1894, the Church of Reconciliation long played a role in unifying a diverse workforce that flooded the German capital as industrialization took hold. For much of that history, its congregants were simply known as Berliners. But in the wake of World War II, the city was divided into fourths, and this Protestant church fell ever so slightly into the Soviet sector. Many of its parishioners lived across the street in the French administered section. When the Communists’ final concrete fortifications sealing the border were erected in 1961, the outer wall separating a fortified East Berlin from the West stood just a few feet in front of the church’s main steps. An inner barrier beyond which people in East Berlin could not safely pass was built just behind the church’s back wall. Thus, the sanctuary was completely barricaded inside the East German “death strip.” Its spire became a watchtower. Much of the congregation carried on though, meeting in freedom mere steps away from their now inaccessible house of worship. This sacred place that had been emptied by force became an embarrassing symbol of Communist repression. The broader church in East Germany was also becoming an incubator of peaceful opposition. In response, government authorities flexed their muscle and tore down the 90-year-old Gothic Revival structure on January 22, 1985. Images of the church being destroyed inspired worldwide outrage and bolstered internal opposition. International pressure and a national movement that had its roots in East German Christianity would eventually topple the Berlin Wall without a shot, just four years later in that seismic year of 1989. The Church of Reconciliation then began to rise anew from a heap of rubble. Today, visitors see the preserved outline of the old building and can worship in a solemn modernist chapel that preserves the bells, altar carvings, and other salvaged remnants of its predecessor. What is now known as the Chapel of Reconciliation powerfully memorializes those who died in the “no man’s land” between East and West Berlin. Consecrated on November 9, 2000, the eleventh anniversary of the Berlin Wall’s fall, it also serves as the home to a small, but still vital, congregation of believers. On the grounds surrounding the chapel is a large stone relief carving that once adorned the old church’s frieze. The image is of a lamb holding the banner of triumph — Christus Victor. All of this reminds us that Christianity sometimes finds itself on fault lines not of its making. Political powers will try to co-opt the church for unholy uses or even destroy it. The job of the Christian community is to persevere and maintain its primary loyalty to the Lamb who will emerge victorious in the end. Today in America, though, loyalty to Christ is challenged by a president who demands complete loyalty to himself. Many leaders of the religious right, understandably concerned by the cultural advances of aggressive sexual revolutionaries, have responded by going mute on even the issues of personal integrity that they once loudly trumpeted. Pushing biblical issues like creation care that are seen as running counter not just to the president but to the broader GOP coalition seems even riskier. Risk runs both ways, though, as young believers are increasingly turned off by such environmental inaction and moral hypocrisy. Republicans may well be sacrificing both the health of tomorrow’s party and planet on the Trumpian altar of today. Responding to the groaning of creation might currently mean marching against the federal government ripping an undocumented Mexican child from her mother’s arms and protesting the Supreme Court telling local governments that they can never stop an American mother from ripping an unborn baby from her womb. It could mean lending a hand to the unemployed miner who long pulled out coal from beneath the hills of West Virginia while also speaking against the colossal strip mines that have eliminated both jobs and the mountains themselves. Issues like these are, too often, seen only through an adversarial partisan lens rather than from an overarching logic of love. The factors that currently separate Christian conservatives from embracing the biblical work of stewarding God’s creation are significant but not impenetrable. Partisanship and the forces of distraction are real foes, but scripture and examples from Francis of Assisi to Francis Schaeffer point the way. Barriers that seem as hard as concrete can indeed come down, and sometimes faster than one might expect. It was just a bit over four years from the grim day when the Church of Reconciliation faced the Communists’ wrecking ball until the night free Berliners jubilantly brought their own sledgehammers to the hated barrier between them. The walls of Jericho came down with a shout after the people of God were obedient to the Lord’s call for a mere seven days. And, most importantly, it took only three days to go from the darkness of Calvary to the dawn of a new creation on Easter morning — when the stone was rolled away, a brilliant light shined, and the risen Jesus was mistaken for a gardener. Caring for creation was humanity’s first job, and we are still on the clock. John Murdock is a law professor and writer. A native Texan, he currently resides in South Korea. You can follow his work from around the globe at johnmurdock.org.